"What does a wood board feel like to surf?" I get that question rather often. 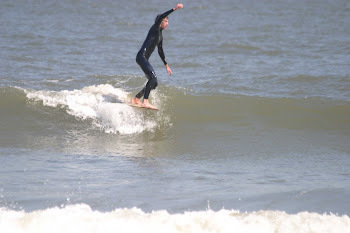 Usually I'll offer: Doesn't flex like foam (no kidding), crank a bottom turn and you'll go where you point it, power moves from your feet right into the wave. I can see when I've lost them their eyes glaze over, so how do you describe something completely different? I suspect HWS boards are more akin to skis, each has it's pucker factor. 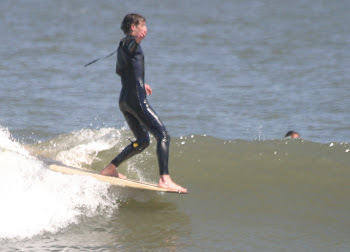 The other night, nothing really good on TV, while Googling wood surfboard, I found Flying A Surfboards out of Carpentaria, California ( http://flyingasurfboards.blogspot.com/ ). Josh builds beautiful balsa boards but what intrigued me most was his description of how to define riding a wood boards. He said: Positive Directional Feel. I might add to that with Mobility. 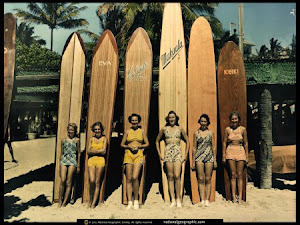 What I also found interesting was Josh saying, "There is a wooden surfboard renaissance going on.". What I also found interesting was Josh adding, "There is a wooden surfboard renaissance going on.". I've really never thought about what we are creating a new way to connect with surfing roots in a modern way. Some builders are doing solid balsa or Paulownia boards, some are doing chambered boards, others foam core with wood decking, and others are spar and rib technique - like what Josh and I do . What I find interesting is we all share the same desire to build with our hands with materials nature provides in a way that is good for our environment and that offers a unique surfing experience.